After Arsenal horror show, is there still a "big six"? All throughout the build-up to this, so far, enthralling Premier League season, the question asked was which of the "Big Six" would be able to pull away and make themselves champions. But after Arsenal's appalling, lifeless, display in their 4-0 hammering by Liverpool at Anfield the question that now surely has to be asked as to whether there really still is a six-team elite in the division? Last season, while the team struggled to finish fifth, there was constant speculation about the future of their manager Arsene Wenger but that uncertainty was supposed to end when the Frenchman was given a new two-year contract. Yet here we are, not yet at the end of August, and sections of the Arsenal support are calling for Wenger's removal and the team's displays suggest far deeper problems afflict the North London club than just a slow start to the season. It was not so much the scoreline at Anfield, bad though that was, that dejected the Gunners faithful, it was the utterly lifeless performance, dreadful body language and general sense of malaise about the team that was so depressing for them. Amid the stinging criticism from former players and pundits, perhaps the most damning comment came from the team's goalkeeper Petr Cech. "OK, you can come and lose a match 4-0 if you have a bad day, when you are fighting but are unlucky, but not like how it happened today," he said. "We were not fighting, not winning any individual battles, and we completely failed to respond to their way of playing. This is the most disappointing thing," added the Czech keeper. 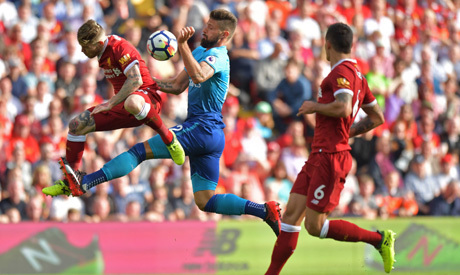 It was the biggest match of the season so far for Arsenal and against a team who, for all their attacking prowess, many believe have a weakness at the back. Yet Wenger chose to leave his new French striker Alexandre Lacazette on the bench and play Danny Welbeck as a lone forward with unsettled Chilean Alexis Sanchez floating somewhere, ineffectively, in a deeper and wider role. The way Arsenal set up tactically was in the fashion of a mid-table side away to a big club - only without the commitment, fight, pressing and graft that those teams usually display. Wenger did not try to gloss over the performance calling it "absolutely disastrous" but he could offer no clear explanation for why his team appeared so unfocused. "That is very difficult to answer after the game. There are some reasons but I don’t think I have too much to comment on that now," he said. Wenger has until Thursday to ship out any players he no longer wants and to find replacements but barring an uncharacteristic late flurry in the market, it is difficult to see this Arsenal team being anywhere close to the title race. Indeed, if the Gunners performance is contrasted with Everton's energetic and aggressive display in their 1-1 draw at Manchester City last Monday, it is fair to ask whether the top six is even on the cards. Certainly the two Manchester clubs along with Liverpool and Chelsea are a cut above the current Arsenal. Tottenham are having teething problems this season but a team that finished second last year should be aiming for the top four once they get used to their temporary residence at Wembley. Everton may have been clear second best at Chelsea on Sunday in a 2-0 loss, but Ronald Koeman's side have shown enough to indicate that their strengthened squad can realistically target sixth place. Arsenal have attacking talent but without steel in midfield and organisation and basic competence at the back, they look destined for another frustrating season. It is hard not to wonder if the decision to renew Wenger's contract was merely putting off the inevitable overhaul and cultural change that will be required when he leaves. The biggest question of all, though, is whether the Arsenal hierarchy, in particular the largest shareholder American businessman Stan Kroenke, are ready to make those changes and commit to truly competing, in the transfer market and every other level, with the "Big Five".